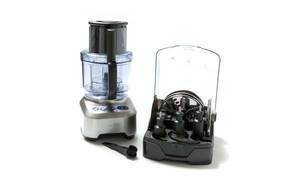 Snapshot: The Breville the Kitchen Wizz Pro BFP800 food processor has 2 speeds and a storage box for all attachments. How does it rate? Excellent results in our carrot-slicing test. Excellent results in our breadcrumb-chopping test. Excellent results in our cheese-grating test. Good results in our pastry-kneading test. Excellent results in our mayonnaise-making test. Storage box for all attachments. Blades can’t be accessed by hands through chute. Unit is stable on the bench when processing. Attachments are top-shelf dishwasher safe. Not suitable for grating cheese. “Quad” processing blade is very sharp and can be unsafe (although brush is provided for safe cleaning). Manufacturer warns against grating cheese - doing so will void warranty. Processor blade performs better than dough blade in our pastry-kneading test. 19 Aug 2017, G H C.
Have been using mine for more than 4 years and it has not let me down. Because of the two bowl sizes no job to big or to small. I always wash by hand after using and I find this no trouble and keeps it in great order. "2 bowls in ten months"
16 Dec 2015, Carolle W.
Breville was great with their response to cracked bowls which ended in a full refund. After using for a few months the bowl developed a crack near the spindle. Breville replaced it but the new bowl developed the exact same crack within two months. Useless for any liquid ingredients after that. Breville said there was nothing they could do because all the bowls are the same, they did however give me a full refund. Obviously this is appearing to be a design fault.